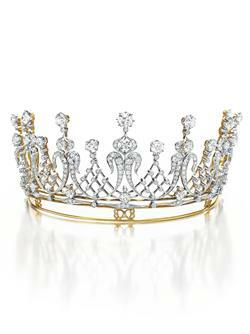 The most extraordinary aspect of the Elizabeth Taylor Jewelry Collection, now on its way to the CHRISTIE’s auction block…is that they were not only given with love, and admiration by her many consorts, but they signify a true luxury brand personality that is significant in that its more than just the surface aspects of Beauty. The Queen, “La Liz”, was more than a star in the film stratosphere. The MOCA exhibit was a nice summary of Liz’s life, passions, loves, and her Queenly stature. As one of the few women in the world who received such historic jewelry, he beauty and “attitude” about this luxury was always casual. Who else but Liz could wear jewels in the swimming pool? Seeing these many pieces up close, the one piece most significant was the “Crown” shown here, was seen in many photos and of course, there are so many more. Her life and loves indulged her girlish love of the glittering stuff, and, with a selection of pieces expected to create more than 30 million in sales, her beloved charities will be all the benefactors of these extraordinary “Queen’s” collection. Luxury has many faces and she remains one of the most significant in film history. Her talents, extraordinary dedication to charity and perhaps the most memorable moment only those of us who live here in Los Angeles might recall... she actually stopped the WRITERS STRIKE…and the GUILD voted to allow her, to “cross” the picket line to raise money for AIDS awareness. Her most treasured cause created a cease fire, between the writers and producers. Only “Liz” could have done this, and, its a true testament to her worldwide, lifelong dedication to those who needed her. More than luxury, more than beauty, art, and grace, Ms. Taylor had the ability to bring a variety of people together in a way that was more than just the face. She is imortal…and like a great luxury brand, larger than life itself.